Eileen and Gib arrived to find an acute housing shortage. They decided to make a claim on some land and build their own house. They camped for 3 days at a camp site, paying $.25 a night to Langs Store. The store was located in Mountain View just out of Anchorage. 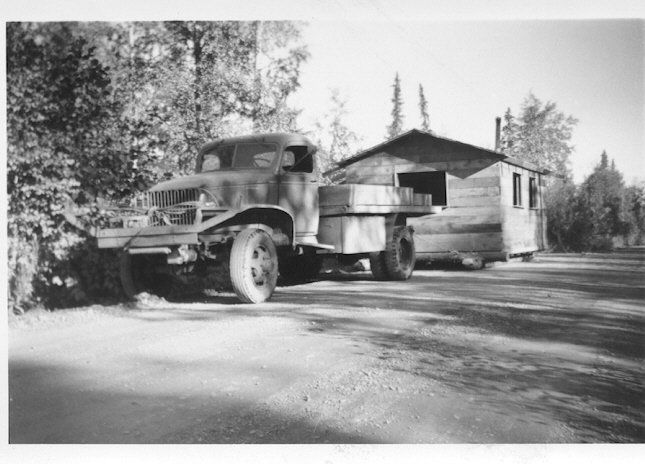 Leaving their small trailer at the camp, they drove their jeep around the Anchorage area looking for land. They backtracked along the Palmer Highway, scouting a compatible and attractive area between mile 18 and 21, meeting and talking to other families that had just come up the Alcan Highway. Finding an empty spot at mile 21; where Lois & Bob Stewart made their homesteaded at a later date; we set up a small tent, borrowed from Gladys & Glen Rogers another newly arrived couple. We only stayed at this spot two weeks, making friends with the other newly arrived families along that part of the Highway. 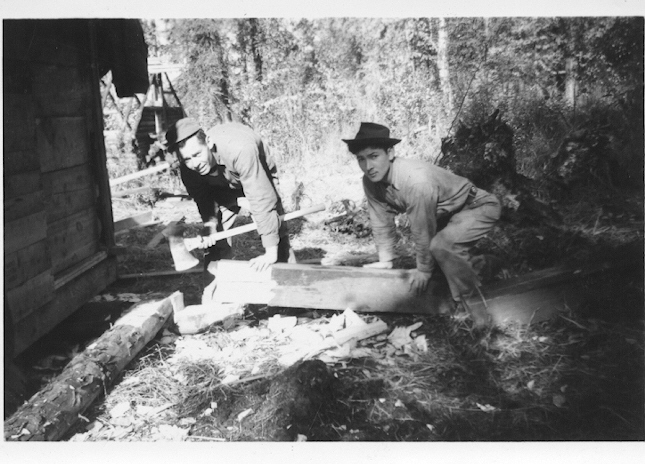 There was a feeling of camaraderie, sharing, and willingness for hard work among these, and other newly arrived pioneers, which made it possible to start and build the communities of Peters Creek, Chugiak, Birchwood, and Eagle River. By the fall of 1947 there were 23 families residing along the Palmer Highway, from milepost 12 to milepost 26. 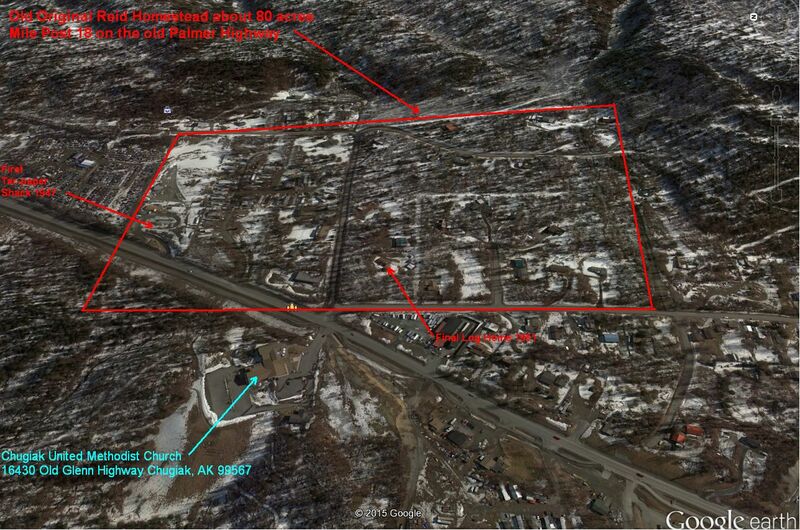 This area became loosely called Eagle River, Fire Lake, Chugiak, and Peters Creek. There were no defined boundaries at this time. But many families had taken up residence by the summer of 1947. 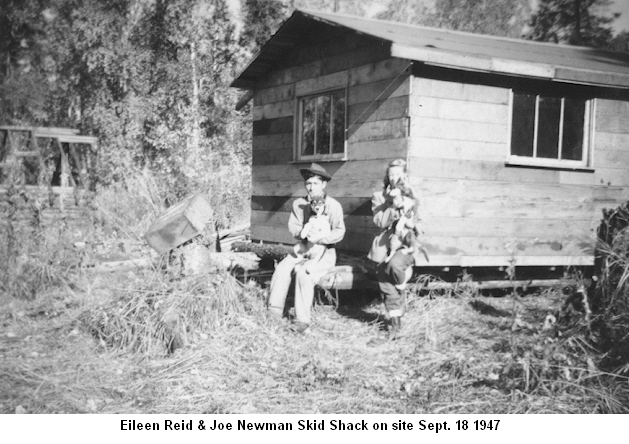 On about July 24, 1947 Eileen and I moved to the area on the Palmer Highway to become known as Chugiak, Peters Creek, Birchwood and Eagle River. 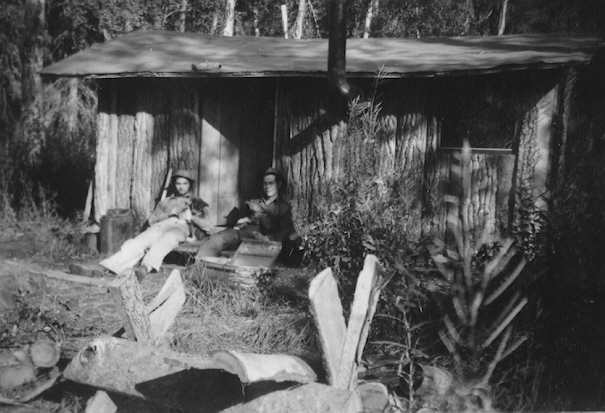 We first squatted on land located at about mile 21 ½, near where Lois and Bob Stewart homestead at a later date. We lived in a tent, borrowed from Glades and Glen Rogers for about a week. 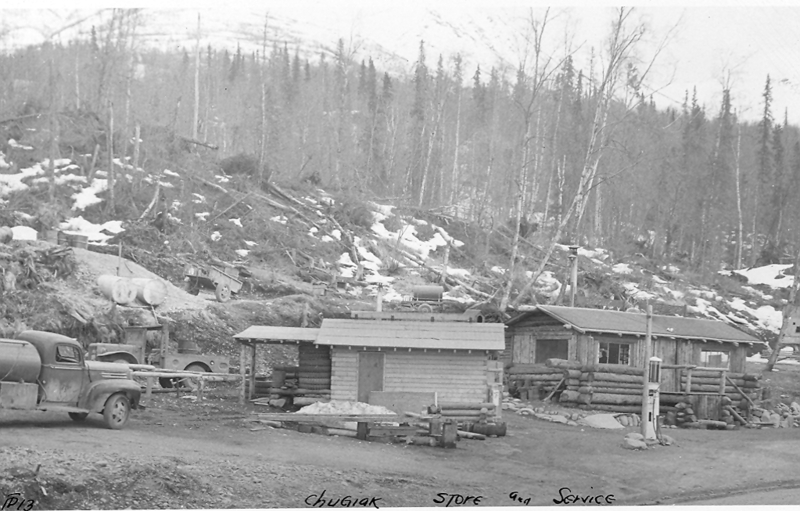 The Rogers took a trade and manufacture site next to Leo Robinson, at the brow of the hill, on the Bear Lake; (later named Mirror Lake); side of the road. Through the suggestion of Jim McDowell's we moved onto an abandoned cotton wood slab shack which was built by the Crousy brothers. 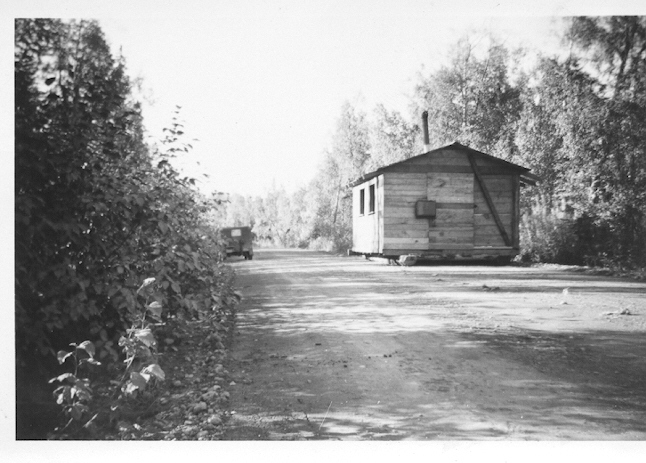 This shack was located at mile 18 on land that would become part of our 73 acre homestead at mile 18. We contested a Sgt. Dwainua's claim, and the BLM found in our favor, so we posted the 73 acres of un-surveyed land. 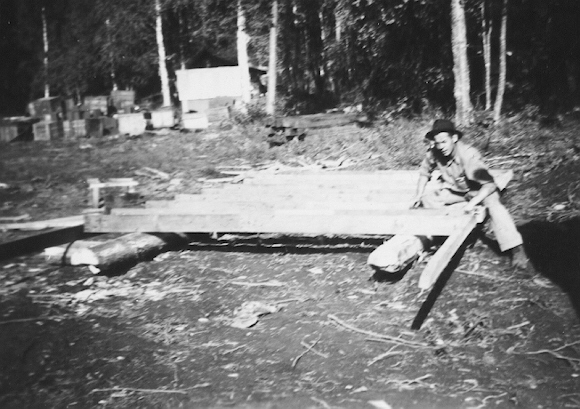 In the meantime we had been building; with the help of Joe Newman and Simon Media; a Wanagan [skid shack] on Media property. 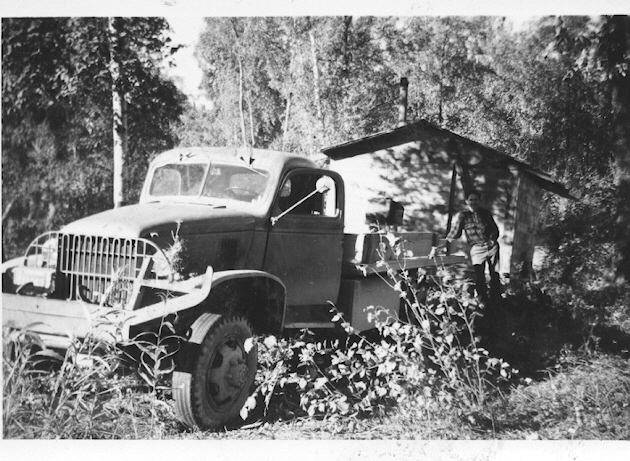 On 15 Sep. 1947 John Stockhousen pulled; with his 1½ ton Chev. 4x4; our Wanagan down the road from Simon's property near Moose Horn Trading Post; onto our homestead at mile 18. We moved right in our new home! 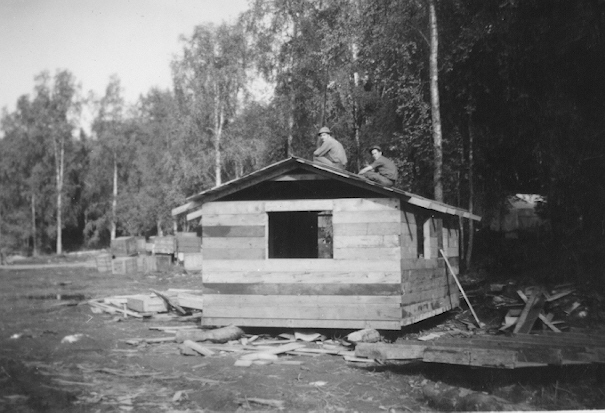 A 10' x 16' building made out of Dump Lumber from Fort Richardson. Located on the Reids new home site were three existing buildings. 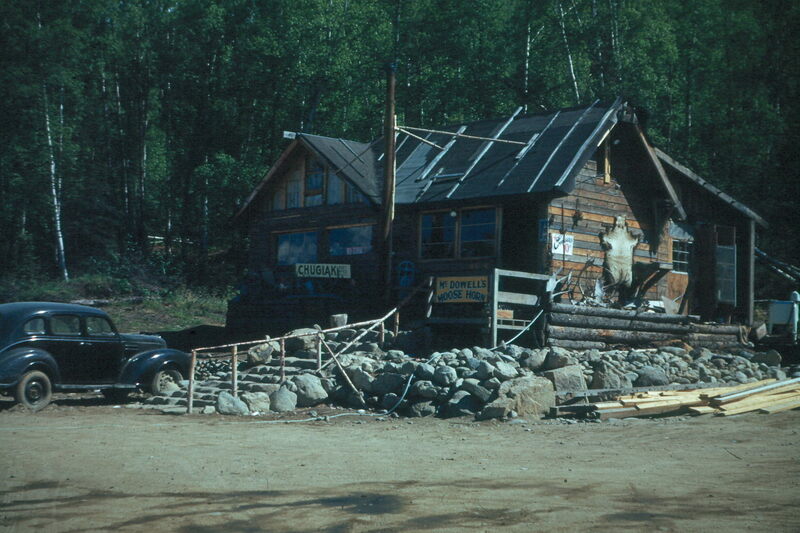 The Moose Horn Trading Post and later Temporary Chugiak Post Office was one of the hubs of the new formed area. To be continued, more to come as I get time.